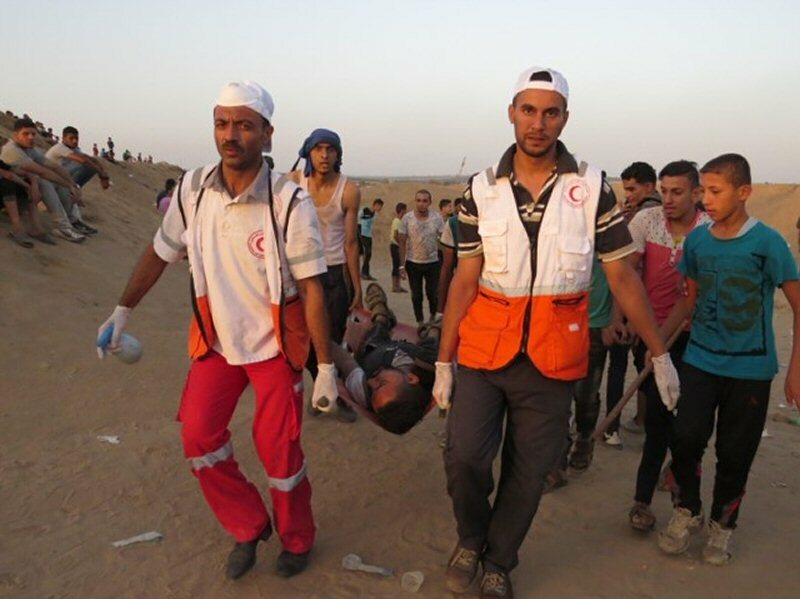 GAZA, PALESTINOW.COM — Dr. Ashraf al-Qedra, the spokesperson of the Health Ministry in Gaza, has confirmed that Israeli soldiers killed, Friday, two Palestinians, including a child, and injured 415 others, including 11 children, two women and three medics, in the “Great Return March” processions along the eastern parts of the Gaza Strip. Palestinian factions as well as national and Islamic organizations in Occupied Jerusalem called for boycotting the Israeli municipality elections completely: running and election. 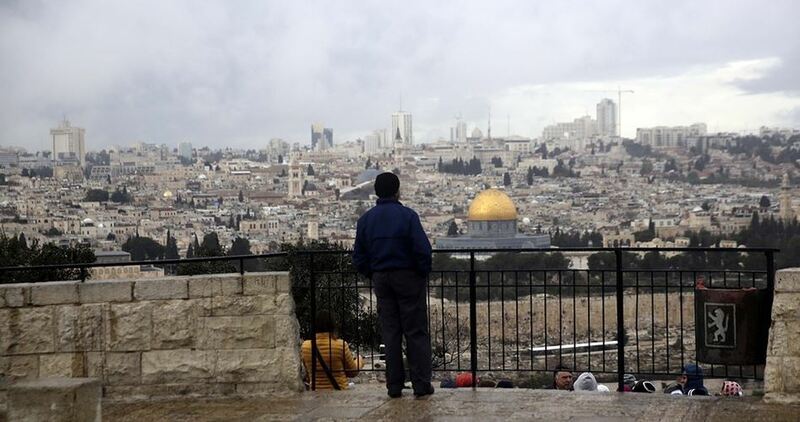 In a statement on Friday, the factions and organizations highlighted that Jerusalem is an occupied city according to international and humanitarian resolutions. The statement also stressed the Palestinian nonrecognition of annexing the city, which was occupied in 1976, to 1948 Occupied Palestine which is called “Israel”. The statement considered the participation in Israeli municipality elections as a political recognition of annexing Jerusalem to Israel, which is refused by Palestinians, Arabs and other international countries, as well as an approval of the US decision of annexing East Jerusalem and moving the US embassy to the occupied city. 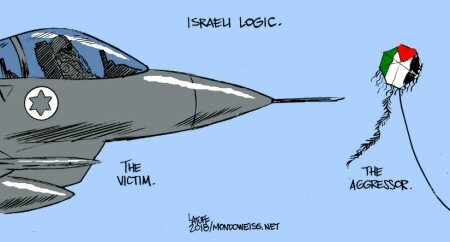 The British newspaper The Guardian banned a cartoon criticizing Israel’s killing of Palestinian paramedic, Razan al-Najjar, on the grounds of anti-Semitism. 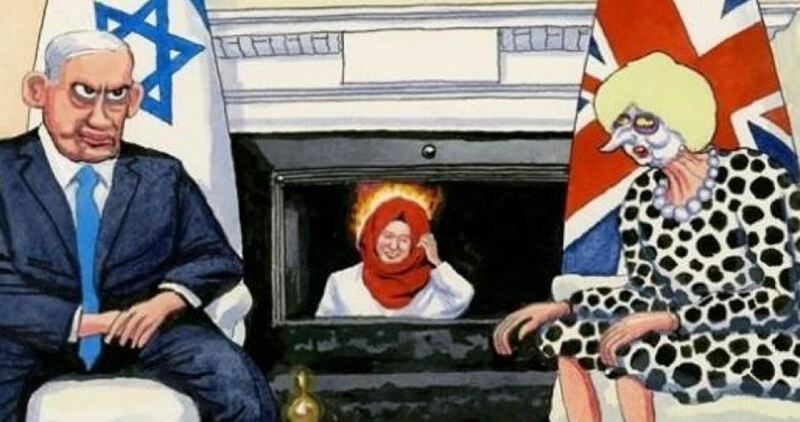 The rejected cartoon shows British MP Theresa May sitting alongside her Israeli counterpart Benjamin Netanyahu in Downing Street, while Palestinian medic Razan al-Najjar burns in the fireplace behind. Al-Najjar, 21, was shot and killed by an Israeli soldier on June 4 during a protest in Gaza. In emails sent to staff, Guardian cartoonist Steve Bell said that he had been “unfairly traduced and censored” and accused Guardian editor Kath Viner of not speaking to him because she “did not really have an argument” for spiking his work. The debate was discussed at the House of Lords by member Tony Graves who said that banning the cartoon was not necessary and that it is time for Israel to be accountable for its actions. Thousands of Palestinians marched Saturday afternoon in the funeral of Yaser Abu al-Naja, 13, who was killed on Friday by Israeli gunfire while taking part in the Great March of Return east of Khan Younis in the southern Gaza Strip. 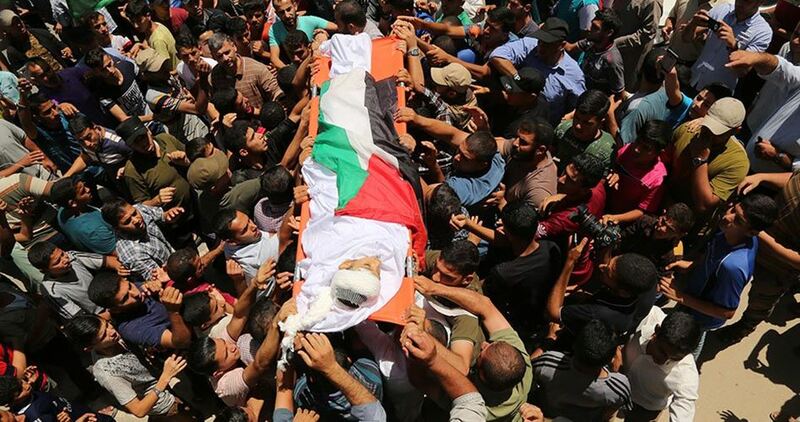 The funeral was attended by a number of Hamas officials including the member of Hamas’s Political Bureau Khalil al-Hayya who said in a speech that the killing of Abu al-Naja is a new crime added to Israel’s endless series of crimes against the Palestinian people. Al-Hayya added that Abu al-Naja’s blood will push the Palestinian people to make more sacrifices and unite against the conspiracies plotted to liquidate their cause. Abu al-Naja was one of two Palestinians killed on Friday by the Israeli occupation forces who attacked the civilians participating in the Great March of Return protests along Gaza’s eastern border. Since the start of the Great March of Return on 30th March, over 130 Palestinian civilians have been killed and about 14,000 injured. A number of Palestinian citizens were injured on Saturday during clashes with the Israeli occupation forces (IOF) in Beit Ummar town, north of the West Bank city of al-Khalil. Anti-settlement activist Mohammed Ayyad said that dozens of Palestinians suffered breathing difficulties while a young man suffered different fractures while being chased by the IOF soldiers who stormed the town amid heavy firing of teargas canisters. Ayyad added that the IOF seized two Palestinian vehicles in Beit Ummar and burned a farmland using teargas canisters. 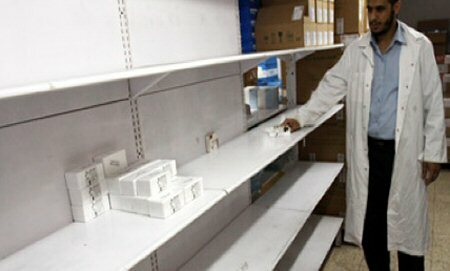 The director of the blood and tumors pharmacy at Rantisi Hospital for Children, Talha Balousha, warned of a severe depletion of the drug Mercaptopurine, and the resulting threat to the lives of children with leukemia. Balousha said, on Thursday, in a press statement, that the depletion of the drug threatens the lives of leukemia patients, as it will cause a gap in a therapeutic protocol which has lasted for two years, according to Al Ray. He noted that the drug is a chemotherapy tablet which is given to dozens of children with leukemia, over an 18-month period. He stressed on the importance of this stage, in the therapy, in preventing any deterioration of the patient’s health, noting that prolonged interruptions of treatment, during this period, will have a direct relationship with an increased risk of relapse. He called on all concerned officials to work hard in resolving this crisis, in order to save the lives of these children, adding that the cost of the drugs in the private sector has upped to four times its actual price. New Israeli regulations stipulate that condoms will not be allowed to enter the Gaza Strip, as they might be used in violent actions. The Times of Israel published, last week, a report with the title “Condoms, kites and birthday balloons: ‘Silly’ Gaza weapons could lead to real war”. The report states, according to Days of Palestine, that Palestinians in Gaza are relentlessly flying a variety of airborne devices attached to flammable materials to be launched, into Israel, near the Israeli-Gaza border, causing hundreds of fires and millions of shekels in damage. 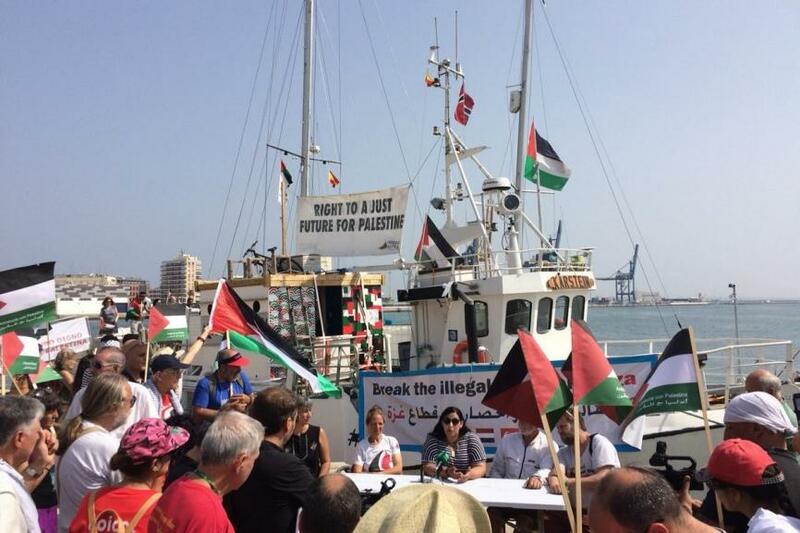 Palestinians rely on the gentle Mediterranean coastal breeze to push their new weapons across the border. The report ignored the fact that the Israeli occupation army had killed 138 Palestinians and injured 14,700, including women, children, medics and journalists in Gaza, since the beginning of the Great Return March, in March of 2018. Given their limited resources, Palestinians rely on such an innovative way to retaliate. No Israeli casualties were reported during the same time period. Palestinians reportedly launched 600 kites from Gaza during the Great Return March, with Israel claiming it had intercepted 400. There was an unconfirmed report that these kites have brought down 10 Israeli drone aircraft. 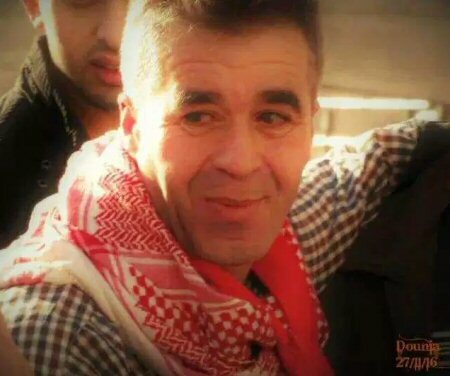 Palestinian grassroots activist Wael al-Faqeeh, a coordinator at the Tanweer Forum in Nablus who frequently works with international solidarity activists, was seized in the early morning hours of Thursday, 28 June 2018 by Israeli occupation forces. Al-Faqeeh is the latest in a series of popular resistance organizers to be targeted by the Israeli occupation for arrest and imprisonment. He is a long time civil society leader in Nablus who has been arrested on multiple occasions for his work in land defense and supporting popular struggle against settlements and Israeli occupation and colonization. Recently, he has been working with Tanweer to support local women’s cooperatives growing za’atar in the villages around Nablus, helping to support land cultivation by Palestinians and supporting women’s economic independence. 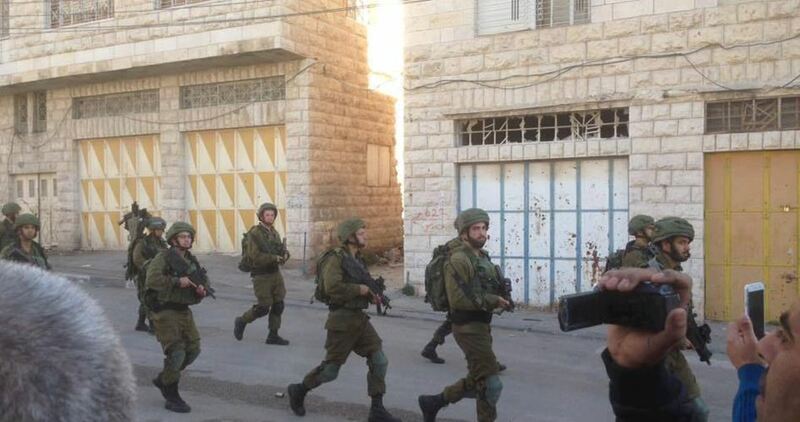 He was reportedly taken to Megiddo prison after being seized from his home in a night raid. This is the fourth time he has been arrested; he has spent several years in Israeli prison over multiple arrests and was released for the last time in February 2017 after serving a sentence of over one year. Many of his friends and comrades around the world have shared their outrage on social media about his arrest and are demanding his immediate release. Several of his friends have also expressed that Wael has been by the bedside of his best friend, who is receiving treatment for cancer, and that this arrest is also an attack on his family and friends who rely on his support and involvement.